To Braganza on the "Ships starting with B" page. Tonnage: 6327 gt, 3935 net, 9900 tdwt. Built by William Doxford & Sons Ltd., Sunderland in 1924. Previous name Pacific Trader until 1938. Errors may exist, and voyages are missing. Previously traded in Indian Ocean & Pacific. Jan. 27 Swansea Clyde Jan. 28 Independent (See also narrative). Febr. 1 Clyde   OB 281 Dispersed Febr. 5. Oil in fuel, broke down Febr. 28. Aug. 13 Loch Ewe   ON 6 For Baltimore. 1942 Jan. 23 Liverpool   ON 59 Again, see also Page 2 above. Dispersed in 41 30N 52 53W, Febr. 6. Sept. 27 New York City Gitmo Oct. 4 NG 309 For P. Gulf. 1943 March 16 Capetown   CD 10 Detached March 23. (stop at Bandar Abbas not mentioned, Page 2). 1944 June 25 Bombay   BA 74 Detached for Durban, July 3. For information on voyages made in between those mentioned here, please see the documents received from the National Archives of Norway and A. Hague's Voyage Record above. Follow the convoy links provided for further info; the Commodore's notes and/or narrative are also available for some of them and several Norwegian ships took part. According to Page 1 of the archive documents, Braganza was on her way from Savannah to Yokohama when war broke out in Norway on Apr. 9-1940. She arrived Yokohama on May 18, having stopped at Cristobal, Los Angeles and Vancouver en route. It'll also be noticed, on the same document, that she had problems with her engines that summer; she had left Cochin for Miri on July 7 but returned to Cochin with engine failure the following day. She left Cochin again a couple of days later, subsequently spending quite a long time at Colombo. As can be seen, she also had a long stay in New York that fall, before heading to St. John, N.B. With a cargo of steel for Newport, she was scheduled for Convoy HX 91 from Halifax in Nov.-1940, but did not sail. Going back to Page 1, we see that she was still at St. John, N.B. when this convoy left Halifax on Nov. 25. From St. John, she proceeded to Halifax on Nov. 30, arriving Dec. 1, and was scheduled for HX 94 on Dec. 6, but was again cancelled. She eventually got away with Convoy HX 95 on Dec. 10; her destination is now given as Cardiff, where she arrived Dec. 27, cargo of steel, general and trucks, station 92. See also this report on the passage of HX 95. Braganza subsequently remained in Cardiff for almost a month. She was scheduled for Convoy OB 279, which left Liverpool on Jan. 28-1941, but she did not sail (destination Tampa - ref. external link provided further down on this page). She shows up again, together with Leka and Lincoln Ellsworth, in Convoy OB 281, which originated in Liverpool on Febr. 1 and dispersed on the 5th. According to A. Hague, Braganza broke down on Febr. 28 due to oil in her fuel and arrived Bermuda in tow on March 7, continuing in tow that same day to Tampa, where she arrived on March 14, then on to Galveston, with arrival on the 17th, still in tow (remaining there until Apr. 11 - again, see Page 1). On May 10, she was scheduled for Convoy HX 126 from Halifax, but did not sail (John P. Pedersen and several others were sunk - follow the links for much more info). She was also cancelled from Convoy HX 127 and HX 128, but joined HX 129 on May 27. The Cruising order/Commodore's notes are also available. Braganza was bound for Grangemouth with scrap iron, station 13, arriving there (via Oban and Methil Roads) on June 17 and again had a long stay in port; the archive document gives departure Grangemouth as Aug. 5, when she proceeded to Methil Roads and Loch Ewe. We now find her in station 86 of the westbound North Atlantic Convoy ON 6, which originated in Liverpool on Aug. 11-1941. Her destination is given as Baltimore, where she arrived independently on Aug. 29, the convoy having dispersed on the 24th (she had started out from Loch Ewe Aug. 13 - Page 1). She left Baltimore again on Sept. 11 for Halifax, then headed back to the U.K. on Sept. 16 with Convoy HX 150, along with the Norwegian Fenris, Solfonn, Havkong, Garonne, Thorshavet, Topdalsfjord, Varanger and Heina. Arnold Hague says Braganza had 3 passengers on board on that occasion, cargo of steel. He has also included Boreas in this convoy (joining from St. John's, N.F.). Braganza stopped at Clyde on Sept. 28; she later arrived Manchester on Oct. 6, and according to Page 2, she remained there until Jan. 17-1942. She's subsequently listed as bound for New York in the westbound North Atlantic Convoy ON 59, departing Liverpool on Jan. 23-1942, dispersed Febr. 6, Braganza arriving New York independently on Febr. 10. This convoy will be added to an individual page in my Convoys section, but in the meantime, the ships sailing in it (and escorts) are named the section listing ships in all ON convoys; the Norwegian Hardanger (returned), Herbrand, Hilda Knudsen, Kongsgaard, Norsktank (returned), O. A. Knudsen, Pan Aruba, Salamis, Sommerstad (returned), Svenør, Sydhav and Thorshavet are also included. Having remained in New York for several weeks, Braganza headed to Capetown on March 27, with arrival there on Apr. 26. Her 1942, 1943 and 1944 voyages are also shown on Page 2, while convoy information for some of them can be found in the Voyage Record above. As can be seen, she had a long stay in New York in the fall of 1942, with another long stay in Trinidad later that year. 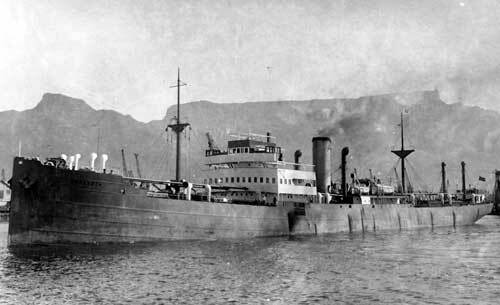 From there, she proceeded to Capetown (Table Bay), where she arrived Dec. 1, and did not leave again until March 16-1943. She had lost a crew member on Jan. 19-1943, when Ordinary Seaman Torgny Jorde died in an accident on board; ref. link to Stavern Memorial at the end of this page. From Capetown, Braganza proceeded to Basra, where she also had a long stay. According to a book written by Jon Veiberg*, entitled "Jon's Odyssey", Braganza was in Bombay for about 3 months for repairs in the spring of 1944, due to constant engine problems caused by leaking lub. oil (this may also explain the many long gaps in her record - going back to Page 2, we learn that she had, in fact, been in Bombay since Aug. 2-1943). He joined the ship there as radio operator in March-1944, newly educated as such at the Norwegian Radio School in London. He says there were 12 British gunners on board, and it appears there were 3 radio operators. She was still there during the big explosion on April 14-1944, but was not seriously damaged. My page about M/S Belray has more information. See also the external link below. * Jon Veiberg's daughter contacted me a while back to tell me that her father shared a cabin with my father on D/S Ringulv. She also told me about his book, which has several passages about, and pictures of, my father in it. (It can be purchased through the Internet, for instance at Amazon.com). Veiberg also writes about his voyages with M/T Elise, M/S Høegh Silverlight and D/S Rio Branco, all listed on this website. He has since passed away (2007). Veiberg says they had a killing on board while in Bombay. The Estonian 2nd cook had been taunted by a Latvian motorman for some time until the cook one day had had enough. After having been threatened by the motorman, the cook chased and stabbed him with a large knife, piercing his kidney area. He died before medical help arrived. At a subsequent trial in Bombay the cook was found not guilty on grounds of self defence. The Estonian cook is not included in the crew list at the time of her loss, so he must have left the ship by then. Braganza finally left Bombay for Durban on June 25-1944 (Page 2); in other words, she had been in Bombay for almost a year. It'll be noticed, that she sbusequently remained in Durban for a month as well. OB (& OA) convoys - OB 279 is included. The Bombay Explosion - Details of the events and several pictures. When Braganza had finally been declared seaworthy again, a cargo was loaded for Durban, and as already mentioned, she left Bombay on June 25-1944, joining Convoy BA 74 (external link), arriving Durban independently on July 14, having detached from the convoy on July 3. Coal was subsequently loaded for Buenos Aires, where they arrived on Sept. 7 (via Capetown on Aug. 19 - again, see Page 2). In Buenos Aires, they took on board 4000 tons of linseed and 6000 tons of canned meats, before heading to Rosario for more cargo, then on to Montevideo, where they arrived on Oct. 4, and where some new people came on board (named in the crew list below). From Montevideo, Braganza was to travel alone to Freetown to join a convoy for the U.K., but at about 14:00 on Oct. 12-1944, 2 days after departure Montevideo (in approx. 32 40S 48 30W - position varies according to source), a fire erupted in the engine room in the after part of the exhaust pot for No. 4 cylinder, and the engine was immediately stopped. The fire spread at a furious speed, and all efforts to extinguish it, both with fire hoses and chemicals, proved in vain. Burning pieces of wood started falling into the engine room and by 14:20 the situation had become so bad that the engine room had to be exited through the escape hatch in the tunnel. The port lifeboats could not be launched because the entire port side of the boatdeck was on fire, but the starboard motorboat (No. 1) and the starboard aft boat (No. 3) were put on the water, the latter was manned. The tackle of No 4 aft boat had caught on fire and the boat fell burning into the water, but No. 3 boat rowed across to it and managed to extinguish the fire, then transferred some people to it. No. 2 boat (forward port boat) ended up hanging down by the foreward tackle because the aft tackle burnt across, but they succeeded in cutting the tackle and pull the boat forward and away from the flames. At 15:00, the ammunition for the Oerlikons on the boat deck started to explode, and when the fire had spread to the holds, all hopes of winning the battle with the flames were abandoned and they all left the ship, No. 2 boat leaving at about 16:40 with the 1st mate in command, and the captain leaving the ship as the last man in No. 1 motorboat at about 17:00. The 1st mate's boat transferred some men to boat No. 3, before boat No. 2 sailed away. The motorboat also transferred some men, including the captain, to boat No. 3, and the latter took the motorboat in tow, which in turn took No. 4 in tow and they prepared to anchor up for the night as a storm was brewing. However, just before they did so the line between No. 3 boat and the motorboat broke, and the other 2 lifeboats drifted away, while No. 3 remained at anchor overnight due to the weather, then headed for Brazil the following morning at 05:00. The men in the motorboat later transferred to lifeboat No. 4, and these 9 men landed south of Rio Grande in the morning of Oct. 17-1944 (the motorboat had been left behind). Boat No. 3 landed a few kilometers away on Oct. 19. All of them were well received by the locals and were later driven to Rio Grande by the consul, where they were accommodated at Hotel Paris. Radio Operator Jon Veiberg, who must have been in boat No. 3 commanded by the 2nd mate, says they had been stopped on the 1st day by a U-boat wanting to know the ship's name, possibly alerted by the fact that Braganza had "blown up in a fire ball around midnight". He says that on the third day a large cargo ship in ballast passed by in a southwesterly direction, but did not see them in spite of flares being fired. Towards evening of the 6th day a lighthouse was spotted. Since this was assumed to be northern Uruguay, a neutral country and, therefore, a place they wanted to avoid so as not to risk being interned (according to international law, being members of a nation at war), they kept rowing north along the coast. The next day a southbound ship was spotted, but again they were not seen. Just after noon that day they were able to take the boat through the breakers and onto the beach (in Rio Grande du Sol province). Towards midnight they were picked up by an Army truck and taken to town, where they were reunited with the men from the boat that had arrived 2 days earlier. Meanwhile, the 1st mate's boat with 18 men had moved away in No. 2 lifeboat as mentioned. They could see their burning ship all night until 04:00 in the morning of Oct. 13. They had also dropped a sea anchor due to the storm, and remained so all day and the next night, their boat filling with water several times. Passenger Magnus Olsen started acting in such a way that he had to be watched, as did the boatswain and Lars Teien. Magnus Olsen died around midnight on Oct. 14, and Boatswain Nygård passed away at 02:00 on the 15th, Lars Teien 2 hours later. All 3 were buried at sea that day. They still had a sea anchor out, but that afternoon the weather improved enough that they could set sail for Brazil. The following day (Oct. 16) they came across a lot of debris, some of which was recognized as coming from Braganza, so they drew the conclusion that she had sunk. Late in the afternoon of the 18th they were picked up by the Argentinian Rio Salado and landed at Rio de Janeiro in the afternoon of Oct. 22 where they were accommodated at the Seamen's Hostel. It appears all the survivors were eventually reunited at Rio de Janeiro, later to be flown to Natal on American Air Force cargo planes, before continuing to Miami 2 days later, via Georgetown, then by train to New York, where the hearings were held on Nov. 10 and Nov. 13-1944. The following were questioned: The captain, the 3 engineers and the assistant, the 1st and 2 mates, the repairman, Mechanic Petersen, Oiler Holst, Stoker Nichols, and Mechanic Travers. * There's also a Hans Himberg listed in the crew list for Olaf Fostenes - same person? * These men came on board in Montevideo on Oct. 9-1944 (some of them were whalers who had been without a job in Montevideo for some time, and had joined the ship in order to travel to the UK). ** The stokers Ebbe Lundberg and George Nichols appear to have been signed on just before departure on Oct. 10 because the regular stokers T. Normann and someone by the last name of Annerfeldt had gone ashore the night before and had not returned in time for departure. Back to Braganza on the "Ships starting with B" page. The text on this page was compiled with the help of: "Nortraships flåte", J. R. Hegland, "Jon's Odyssey", Jon Veiberg, "Sjøforklaringer fra 2. verdenskrig", Volume I - Norwegian Maritime Museum (extract from ship's journal, captain's report and misc. statements given at the maritime hearings) - ref My sources.